What type of grapes are used in this wine? 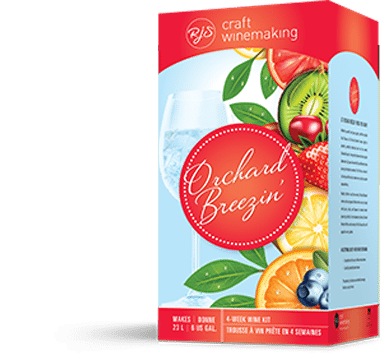 All RJS Orchard Breezin’ kits are made from a proprietary blend of high quality grape juice concentrate. Try it out and let us know how it tastes! Can I bottle this wine without filtering? Absolutely! If you have followed our instructions correctly and your wine has cleared by day 28, you can go ahead and bottle your wine. Hope that helps! Let us know how your wine turns out. Can this wine be stored in the carboy for an extended period of time? If so, should I rack it near day 28 to get rid of some of the residual sugars? Thanks. Yes of course you can keep your Orchard Breezin Cranapple Celebration in your carboy for an extended period of time. Make sure that you rack the wine on day 28 and leave all of the sediment behind. When you rack the wine on day 28 you will not be getting rid of residual sugars but will be removing the sediment which primarily contains proteins from dead yeast cells as well as your clarifying agents which have settled out. Make sure that you top your carboy up with a similar style wine if available after you have racked your wine. Thank you for posting your question! Let us know how your wine turns out. What Is the alcohol content ? Hi Mark, depending on how well the Cranapple Celebration is fermented, on average it should be approximately 6% alc./volume. Thank you for your question. The sugar content can vary based on how the wine is crafted, therefore we cannot give you a definitive answer. However, it can vary from 6-8mg of residual sugar per litre.